The price was very cheap, and had the benefit of a nice restaurant. They also had a bar of course, with almost all the beers on tap. As befitting such a hotel/brewery, they also had beer in the lobby vending machine. 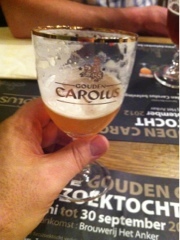 The Goudon Carolus Classic - a Belgian dubbel - was an absolute top shelf beer. Dark, caramel, robust - it had won some recent award for best beer. Maneblusser was another fantastic ale, woops - lager. There was also a good philosophical discussion among some of our members about how to judge beers and beer types. One view is that beers should all be very good, or don't drink them. A contrasting view is that a beer - such as a Belgian Fruit Ale - can be very good in it's own category. It may be truly repellent when compared to a Belgian Tripel, but it has to stand on its own. As such, it is recommended to enjoy whatever beer you want.